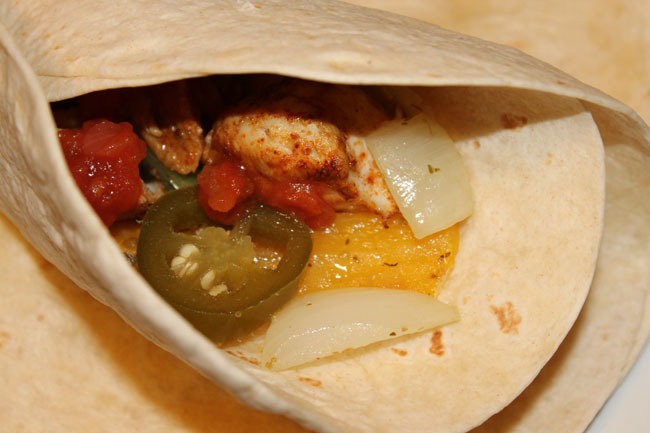 Fajitas – They make you happy. I know the original song was Tequila but both are from Mexico and this song enters my head. UK weather in March? Crazy – snow one day, melted the next day, cold, so so cold, rain and hail. It puts me off going out so I chill at home, cooking, watching cooking TV shows, watching films and playing computer games (not a bad life I admit). I watched Taxi Driver recently. It was not what I expected and was slightly disappointed. It was better than some other films which I watched recently, which were so bad I won’t even mention them by name. I’m starting to love Mexican food and I used to use Fajita kits. They were really nice. I attempted to make it myself once using a Gordon Ramsay recipe and it just didn’t turn out very well (sorry Ramsay). However, this new recipe is fantastic! Preheat the oven to 180 Deg C.
Put the peppers and onion in a roasting tray. Add 2 tbsp olive oil, garlic, oregano, salt and toss well. Cook in the oven for 20-30 minutes, or until the peppers begin to char. Add the chicken to a roasting tray. Add the cumin, chilli powder, salt, 2 tbsp olive oil and toast well. Cook in the oven for 15-20 minutes or until the chicken is cooked.